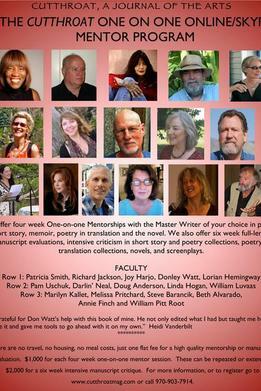 WE OFFER FOUR WEEK ONE-ON-ONE INTENSIVE ONLINE MENTOR SESSIONS WITH MASTER WRITERS IN POETRY, SHORT STORY, THE NOVEL, ENVIROMENTAL ESSAYS, MEMOIR, POETRY IN TRANSLATION. $1,000 flat fee. COMPLETE MANUSCRIPT EVALUATION IN POETRY, SCREENPLAY, THE NOVEL AND SHORT STORY. $2,000 fee. This is much less expensive than a writers conference or writing program. SPACE IS LIMITED! Fee refundable if mentor does not fulfill his/her contract. TO REGISTER, EMAIL cutthroatmag@gmail.com or call 970-903-7914.